Update Missing Person: Matthew Munoz, 22yrs, male, Hispanic, see web msg for pic, seen in Alhambra on 12/17/18. UPDATE (12/19/18 - 5:00 pm): Additional photo has been added, taken in Alhambra on 12/17/18 by a resident. The Munoz family has confirmed the photo is of the Missing Person, Matthew Munoz. 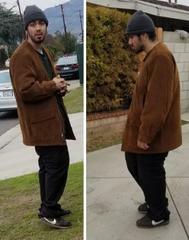 He is believed to still be in the greater San Gabriel Valley area. Munoz was last seen at the Westfield Santa Anita Mall, 400 S. Baldwin Avenue, Arcadia, on Tuesday, December 11, 2018, in the late afternoon. Munoz walked away from a family member and has not been seen since. Munoz is a non-dependent adult who experiences short episodes where he acts “child like” and then reverts back to a normal state of mind. Munoz was last seen wearing a green shirt, grey shorts, long white socks, and black Nike shoes. He has stretched earlobes from wearing plugs and a “Dodgers” tattoo on his right forearm. He has no cell phone or money and frequents the mall, LA Fitness, and the County Park in Arcadia. He has not been known to wander in the past. Anyone with information on this incident is encouraged to contact the Arcadia Police Department at (626) 574-5156, Case # 18-5783. If you prefer to provide information anonymously, you may call "Crime Stoppers" by dialing (800) 222-TIPS (8477), use your smartphone by downloading the “P3 Tips” Mobile APP on Google play or the Apple App Store, or by using the website http://lacrimestoppers.org. Get detailed, up-to-date emails and text messages specific to your community from the Arcadia Police Department by registering for "Nixle" alerts at: https://local.nixle.com/register/ You can also register for alerts and advisory text messages only by texting your zip code to 888777. (Standard text messaging rates may apply, depending on your cell phone plan). Nixle provides community wires nationwide. Once registered, you can subscribe to messages from other areas that service your relatives or other loved ones, or other locations of interest to you. Please call local police or sheriff if found.